Do observe Thanksgiving Day on 23rd Thursday 2017 (Fourth Thursday of November 2017) and every subsequent years, celebrating as Harvest Festival, praising Him in the high (as described in Isaiah 57:15 - "For thus has said the high and lofty One that inhabits eternity, whose name is The Holy One; I dwell in the high place and in holiness and with him also that is of a contrite and humble spirit to cause the spirit of the humble to live and to cause the heart of the contrite ones to live. "), for having good harvests, along with the English who believes that 28 alphabets are in the English alphabet, with Alpha in the beginning and Omega in the end, making it as a language on seven pillars of knowledge around a tetragrammaton singularity point of wisdom, which is Alpha and Omega, providing complete extractive powers for the English language in resonance with Word of God which is creating the spirit, making a Lemniscate symbol of Word of God whose presence gives light and life to the English language, moving along Circular Causality of Cybernetics, enlightening the world as a leading element in the second order Cybernetics, whose sentience can be reflected through the respective sentences along with a curved smile in each, which transforms His people through straightforwadness around a Singularity Point, along with 1948 club, bringing a Cloud Socialistic World, along the way of life of people of God, which is $ (Dollar), believing that God is with US, as we envisaged in the declaration through the picture of Robert Walter Weir ("Embarkation of the Pilgrims"), placed in 1843 in the rotunda of US Capitol Hill, as "God with US", achieving the purpose of creation, under tabernacle of God, as in Revelation 21, which is meant by 'God with US', as in Ezekiel 1:28, with a meaningful national anthem of Global Village, as in 'Amazing Grace'. 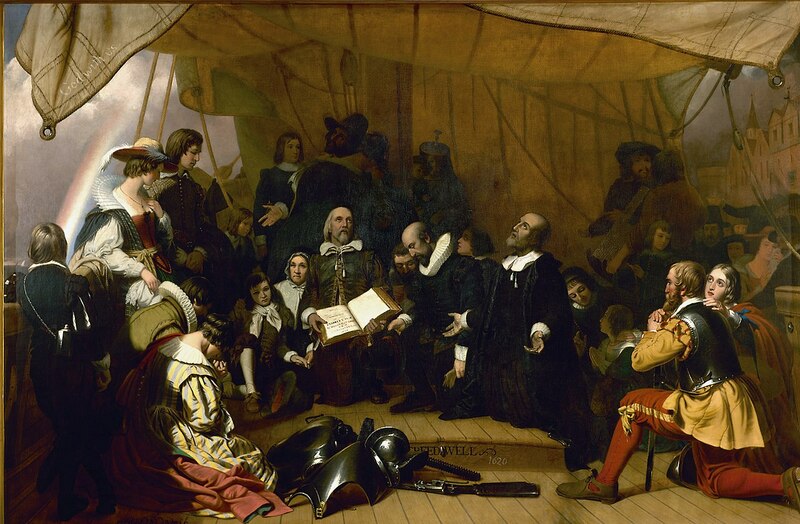 "Embarkation of the Pilgrims" - A picture placed in the rotunda of the US Capitol Hill in 1843, painted by Robert Walter Weir is attached herewith. Note the words "God with us" appear on the sail in the upper left corner of the picture, which is third part of the Bible, through which we are getting the new book known as 'The Word' which is inscribed in the heart of People of God.